Seamstress Ring. Bobbin Ring. Sewing Ring. Quilter Ring. Embroidery Ring. Tailor Ring. Adjustable Ring. Pewter Button Ring. Handmade Ring. Whether looking for a seamstress ring, sewing ring, quilter ring, embroidery ring, or tailor ring, this handmade ring is an elegant option. Handmade with a detailed pewter button that depicts a spool of thread, tiny scissors, and a border that appears to be stitched half way around its edge. The button is re-purposed to sit atop a silver plated adjustable ring base. This handmade button ring is adjustable, making it comfortable no matter the size of the wearer's fingers, as well as ideal for switching from finger to finger. Earth Ring. World Ring. Pewter Button Ring. Planet Earth Ring. Adjustable Ring. Silver RIng. Handmade Ring. 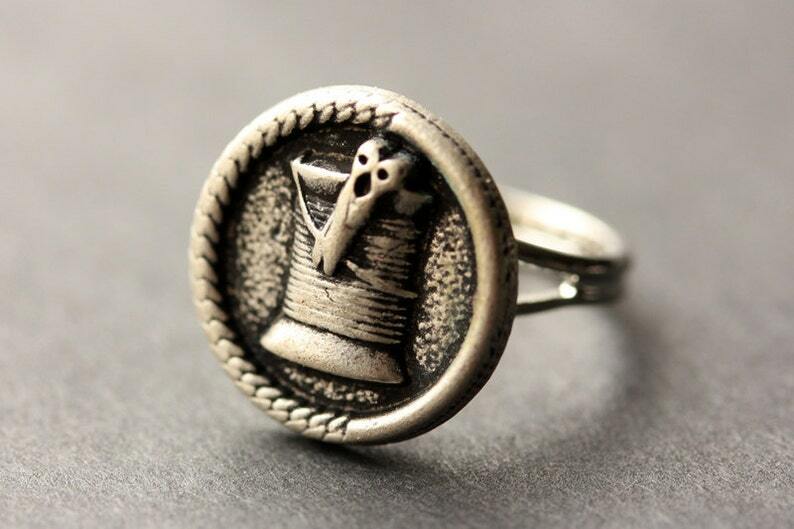 Pewter Ring. Handmade Jewelry. Gothic Raven Ring. Crow Ring. Pewter Button Ring. Bird Ring. Adjustable Ring. Silver RIng. Handmade Ring. Pewter Ring. Handmade Jewelry. Star Ring. Red Ring. Red Star Ring. Silver Filigree Ring. Adjustable Ring. Handmade Ring. Handmade Jewelry. So cute!! Arrived on time in cute packaging! Pink Rose Refrigerator Magnets. Set of Three. Pastel Pink Flower Magnets. Office Magnets. Fridge Magnets. Handmade Home Decor. Purple Pony Ring. Purple Horse Ring. Purple Ring. Adjustable Ring. Handmade Ring. Button Ring. Silver Ring. Handmade Jewelry.